SNAP: March 25, The day Imran Khan's cornered Tigers conquered the Cricket World !! 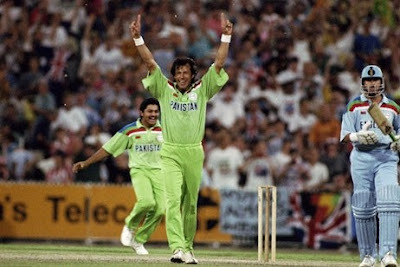 March 25, The day Imran Khan's cornered Tigers conquered the Cricket World !! 24 years ago, on this day Pakistan beat England in MCG to life their First (the only so far) Cricket World Cup. Captain Imran Khan gave a pep talk to inspire his fighting team to beat the more fancied English team. Pakistan were facing elimination after winning just one of their first five matches. Luck also smiled on them when they shared points with England in a rain-ruined match they were poised to lose. Imran's instructions to his team to fight like "cornered tigers" produced the desired results as his side won their last five matches, including the final against Graham Gooch's Englishmen.